Has a lot of color to it, alot brighter than I first thought. Yellow Trillium - Trillium luteum. Yellow Trillium is a rhizomatous herb with unbranched stems that grows close to the ground. Native to then southeaster US, it blooms in mid- to late-spring, producing twisted yellow petals with a lemon scent. In the wild it prefers mature deciduous forests as well as rocky stream banks. The Trillium produces no true stem. The "stem" is actually a subaerial extension of the rhizome rising above ground level. Trillium. goes dormant during the summer, during which time they propagate by division. Yellow Trillium is a prized ground cover, adapting well to shady areas. 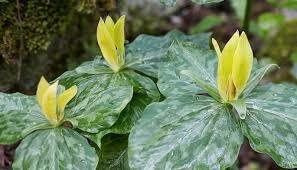 Yellow Trillium flowering plant is native to several states and will grow well in many locations. While native to many areas they do not transplant well from the wild. Though getting the plants from a nursery, they will last many years in the garden. This is a plant that flowers in mid to late spring with a yellow primrose bloom and a trio of leaves. The plant has variegated leaves that often curl and become mottled with a silver-green with a fragrance of the lemon oil. It is a self-seeding perennial and should be planted four inches deep. This is a flower that likes shade, and if left alone it will spread on its own. The plant can be divided when dormant in late summer and will propagate quickly. This is a flower that can adapt to container growing and will return every spring. The flower enjoys humus-rich soil. However, it will tolerate heavy clay with topsoil that drains well but does not dry out. However, it is drought tolerant with some watering before it goes dormant in the summer. 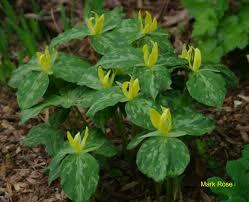 Yellow Trillium needs little maintenance with annual mulching and can be mulched with rotting leaves. The plant goes dormant in the summer and will reappear the following spring. Yellow Trillium grows well with other shade tolerant flowers as one of the first flowers in spring.